The Cognitive Abilities Test (CogAT) is a multiple-choice K-12 assessment that measures reasoning skills with different types of verbal, quantitative, and nonverbal questions. Schools commonly administer the CogAT for admissions into gifted and talented programs. What is on the CogAT Test? The CogAT consists of a verbal battery, quantitative battery, and nonverbal battery. Each battery is a separate section of the test containing 3 different types of questions that cover unique cognitive abilities. How is the CogAT administered? 1. Will the test be given online or with paper-and-pencil? 2. Will all 3 batteries be given? Which CogAT Level will my child take? As mentioned above, it’s important to ask your child’s school which CogAT level they will be administering. Schools can choose to administer an above grade level test if they are looking for highly gifted students. They may also choose to give a below grade level test if students are being tested at the beginning of the year. The grades and CogAT levels listed below are most common. CogAT test prep starts with familiarizing your child with the test-taking process. It is also important to have your child work with CogAT practice questions that are similar to what they will encounter during the CogAT. Sample questions for each specific CogAT level can be found below. Our CogAT Parent FAQ includes answers to the most common questions we receive from parents. 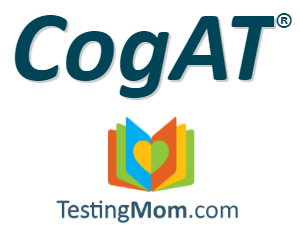 We encourage you to message our Parent Success Team by chatting from the lower left-hand side of the screen or sending an email to help@testingmom.com to find out how we can help your child get their highest possible score on the CogAT. Picture Analogies – These visual based questions make use of 2×2 matrix with 3 pictures and 1 empty cell. Students are required to examine the 2 pictures on top so to their point of relation. The most optimal approach to this question is to start by looking at the picture on the bottom row. The objective is to ensure that the three pictures on the bottom have a parallel relationship to the pictures on top. This section is comprised of 14 questions and takes approximately 15 minutes to complete. Sentence Completion – Students are required to listen to a sentence or question and select the picture that best satisfies the sentence or answers the question. This section is made up of 14 questions and takes approximately 14 minutes. Picture Classification – Students examine 3 pictures on top and determine how they are alike. Then, they must choose the 1 picture on the bottom that belongs in the same group. This section is composed of 14 questions and takes approximately 14 minutes to complete. 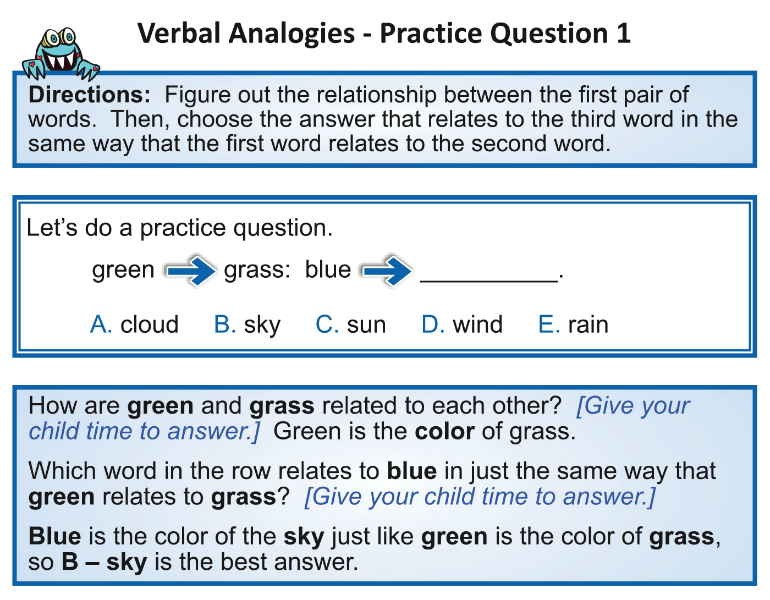 Number Analogies – These require the same thought processes as Picture Analogies except instead of verbal concepts, students must identify relationships between quantitative concepts. Like the verbal battery, this section consists of 14 questions and takes 13 minutes. Number Puzzles – Students see 2 trains. They must select the answer picture that makes the second train carry the same number of objects as the first train. This section includes 10 questions and takes 11 minutes. 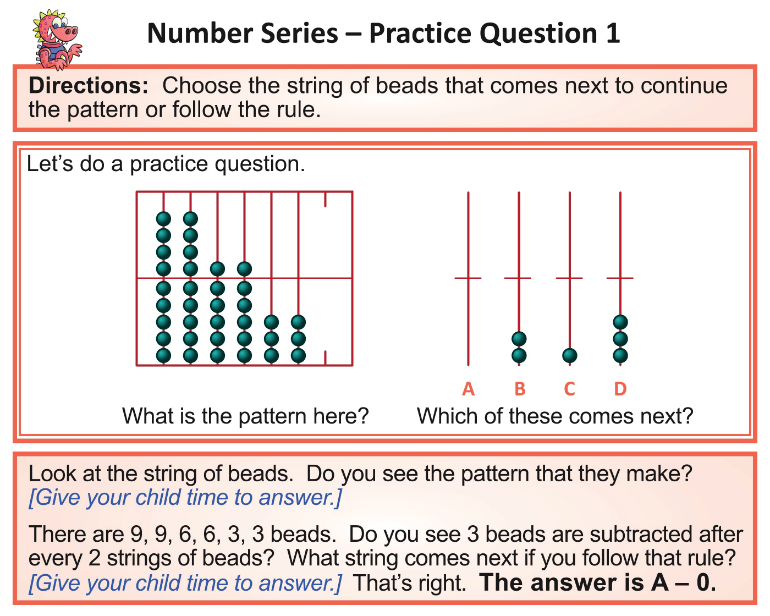 Number Series – Each question shows an abacus with a bead pattern. Students must rely on their patterning skills and select the string of beads that comes next in the sequence. 14 questions. Approximately 10 minutes. Figure Matrices – These figure analogies require the same thought processes as Picture and Number Analogies. Still, instead of verbal or quantitative concepts, students must identify relationships between spatial forms. By studying and identifying distinct points of relation between previous figures, students can asses possible answer choices. This section consists of 14 questions and takes approximately 11 minutes to complete. 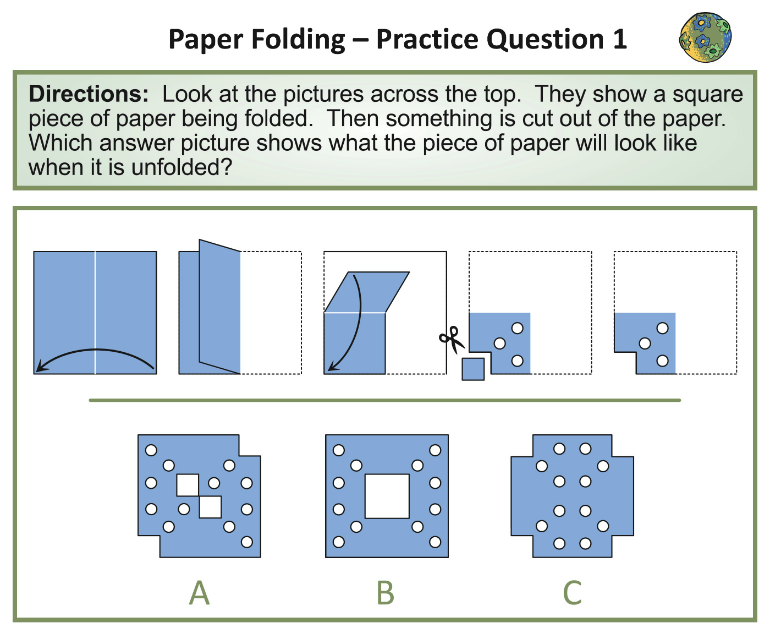 Paper Folding – Students must imagine what will happen to a piece of paper that is folded, then cut or hole-punched in some way, and then unfolded. The TestingMom.com website has a fun, animated game to help students with this subtest. This section consists of 10 questions and takes approximately 10 minutes to complete. Figure Classification – These require the same thought process as Picture Classification, except instead of inferring relationships between pictures, students infer relationships between shapes and figures. They then must find the answer on the bottom that belongs with the group on top. This section includes 14 questions and takes approximately 10 minutes to complete. How is the CogAT scored? CogAT scores are primarily based on a child’s age. Student’s may also be compared to students in the same grade (“Grade Scores”) or with students in the same school district (“Local Scores”). When looking at your child’s age scores, you will see a “Standard Age Score”, “Age Stanine” and “Age Percentile Rank” for each battery. There is also a composite score that is the combined results for each of the 3 batteries. The “Standard Age Score” is calculated by taking your child’s raw scores and putting them on a scale that compares to children of the same age. An average Standard Age Score is 100. The two numbers that are most useful for a parent trying to interpret their’s child’s CogAT results are the “Age Stanine” and “Age Percentile Rank”. The Age Stanine is a number from 1-9 that ranks your child’s cognitive abilities against children of the same age. Stanines are grouped by percentile rank. 1 is considered to be very low while 9 is very high. 5 is the average. The Age Percentile Rank identifies the percentage of students in the same age group whose scores fall below the score obtained by a particular student. For example, if your child’s percentile rank is 95, this mean they outperformed 95% of other children their age. You can find details on the relation between stanines and percentile ranks, as well as in-depth coverage on how the CogAT is scored on our CogAT scoring page. Where is the CogAT given? The CogAT is given across the United States with metropolitan areas having the highest concentration of parents looking to prepare their children for the test. Major areas that administer the CogAT include Seattle, Dallas-Fort Worth, Baltimore, Atlanta, North Carolina, South Carolina, Washington DC, Chicago, Minneapolis, Houston and San Antonio. In 2011, the CogAT test was updated from Form 6 to Form 7. The most significant difference between the two forms are the types of questions for the kindergarten, first grade, and second grade levels. CogAT Form 7 and CogAT Form 8 are the latest editions of the CogAT and reflect the most current research in the measurement of reasoning and problem-solving abilities. Lead author Dr. David F. Lohman, an internationally recognized abilities assessment researcher and winner of the National Association of Gifted Children’s Paper of the Decade award, has built on the strengths of CogAT Form 6 by introducing a variety of enhancements – including new question types, reduced reliability on English-speaking ability, expanded instructor support package, multiple administration methods, and reduced testing times. Due to school districts lack of funding some schools are still using the older CogAT Form 6 while some are using the updated CogAT Form 7. If your child is third grade or above there is very little difference between the two forms. In this case, it is advised that students practice CogAT Form 7 questions. You have hit the mark. In it something is also to me it seems it is good idea. I agree with you. My son practiced for a couple of weeks, took the CogAT for GT admission at his school, and scored at Stanine of 9, which got him in! I almost have to go to take the Cogat test, but I have enough time to study so I will have an advantage for the test when I saw this. I read through it, and I think I will be ready for the test! Cognitive Abilities Test™ (CogAT®) is a registered trademark of Riverside Publishing, a Houghton Mifflin Company, or their affiliate(s), or their licensors. TestingMom.com is not affiliated with nor related to Houghton Mifflin Company or its affiliates (“Houghton Mifflin”). Houghton Mifflin does not sponsor or endorse any TestingMom.com product, nor have TestingMom.com products or services been reviewed, certified, or approved by Houghton Mifflin. Trademarks referring to specific test providers are used by TestingMom.com for nominative purposes only and such trademarks are solely the property of their respective owners.